“Ask and I Shall Receive” is Universal law and how the Universe operates. It is a powerful tool for all of us to manifest all that we need. It is a birthright and blessing for everyone on the earth plane, regardless of our race, color of our skin, belief, social status, education, or wealth, etc. God, Ultimate Being, Divine Spirit, or whatever we call the energy of the Universe, does not discriminate against anyone, but hears and answers every prayer. This is also our dynamic interaction and communication with the Universe. Everyone is able to manifest what they need and more as the Universe hears every prayer and request from everyone. However, we must ask, it is our responsibility. This affirmation is designed to assist you to take-action on talking to the Universe and asking for help from the Universe. 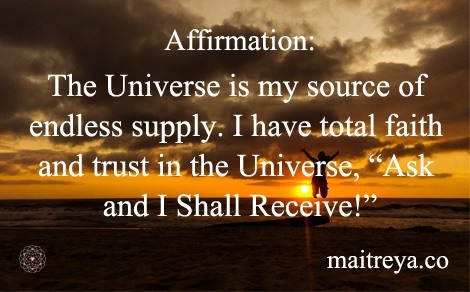 It is reminding you that you can manifest all that you need, the Universe is your endless supply and you should not be afraid to ask the Universe for help! When you openly ask for help without fear and pride, but simply and truly believe, you will have all the help and assistance you need, and you can manifest all that you need. By saying this affirmation, you are letting go of your fear and doubt, and you are affirming your faith and trust in the Universe. For some, it may not happen overnight, but believe it, it will happen. You can repeat the affirmation as many times as you can. The more you say it, the more positive reality you can manifest in your life. We sincerely hope that you can benefit from our weekly affirmation. Please feel free to give us feedback or share your experience with us. Thank you!